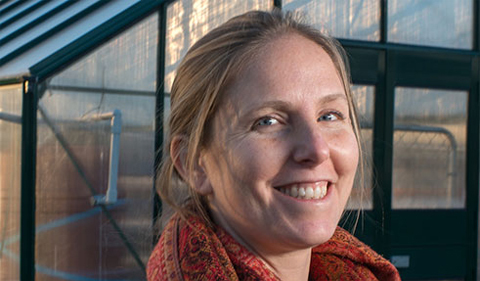 The Environmental & Plant Biology Colloquium Series presents Dr. Sarah Davis on March 1 from 11:50 a.m. to 12:45 p.m. in Porter Hall 104. Davis is Associate Professor in the Voinovich School of Leadership and Public Policy. Abstract: Crassulacean acid metabolism (CAM) affords plants a way to survive despite severe drought and high temperatures. These traits might ensure crop resilience, but only a small proportion of current agricultural production relies on CAM. Ananas comosus (pineapple), Aloe spp., Vanilla spp., Opuntia spp., and Agave spp. are all examples of commercially produced CAM crops, but many others have uses as fiber, food, medicine, fuel, and other bioproducts. Some CAM plants are also high-yielding, like Agave americana which yields 9.3 Mg ha-1 y-1 dry biomass with only 530 mm of annual water inputs. Water soluble carbohydrates in A. americana represent a large percentage of the plant tissue (~44%), and plant tissue carbohydrate concentrations remain consistent even in arid conditions with only 300 mm of annual water input and dry biomass yields of 4.0 Mg ha-1 y-1. There is substantial potential for improved yields with further understanding of CAM responses to environmental conditions. Photosynthetic responses to nitrogen, for example, have not yet been resolved in CAM plants. This presentation will compare the biomass quality of Agave americana with that of high yielding C4 crops, review the agricultural potential for CAM crops, and provide insight into the physiological responses of CAM to a variety of environmental conditions.